Study after study confirms that career development is the single most powerful tool managers have for driving retention, engagement, productivity, and results. Nevertheless, it’s frequently back-burnered. When asked why, managers say the number one reason is that they just don’t have time—for the meetings, the forms, the administrative hoops. But there’s a better way. And it’s surprisingly simple: frequent short conversations with employees about their career goals and options integrated seamlessly into the normal course of business. Beverly Kaye, coauthor of the bestselling Love ’Em or Lose ’Em, and Julie Winkle Giulioni identify three broad types of conversations that will increase employees’ awareness of their strengths, weaknesses, and interests; point out where their organization and their industry are headed; and help them pull all of that together to design their own up-to-the-minute, personalized career plans. 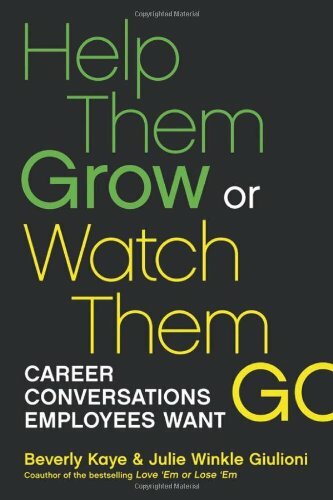 Help Them Grow or Watch Them Go is filled with practical tips, guidelines, and templates, as well as nearly a hundred suggested conversation questions.